If [b:Frostbite|2282133|Frostbite (Vampire Academy, #2)|Richelle Mead|http://d.gr-assets.com/books/1361098960s/2282133.jpg|6651004] made me like the series then [b:Shadow Kiss|2802316|Shadow Kiss (Vampire Academy, #3)|Richelle Mead|http://d.gr-assets.com/books/1361099049s/2802316.jpg|6651006] sealed the love I have for this series and Rose/Dimitri.I was pretty sure that I was having multiple heart attacks during the last 5%-10% of the book. Oh, Richelle Mead, the cruel things you do to my poor little heart.When reading both [b:Vampire Academy|345627|Vampire Academy (Vampire Academy, #1)|Richelle Mead|http://d.gr-assets.com/books/1361098973s/345627.jpg|335933] and [b:Frostbite|2282133|Frostbite (Vampire Academy, #2)|Richelle Mead|http://d.gr-assets.com/books/1361098960s/2282133.jpg|6651004], I've liked Rose and Dimitri's relationship and always thought that they were a cute couple. I have no idea what was so different in this book that made me go totally gaga for the both of them. 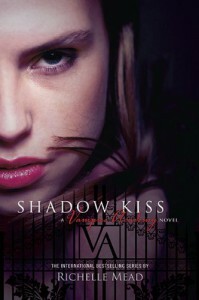 I've read my share of swoon worthy relationships and guys whom I'll willing give up my first born for but after [b:Shadow Kiss|2802316|Shadow Kiss (Vampire Academy, #3)|Richelle Mead|http://d.gr-assets.com/books/1361099049s/2802316.jpg|6651006], Dimitri and Rose are right at the top of my list of fictional couples I'll ship till the day I die. It's not even because they are both awesome, kickass characters but on top of that, they fight for what they love with such amazing passion (yes, this might sound cheesy but it's TRUE). I could gush about them for the longest time but I guess now would be the time to stop before I start sounding incoherent. Basically, I'm bowing down to Ms Mead for creating a fictional couple that seems to good to be true. I'm officially certain that no guy can compare to Dimitri.Shadow Kiss was truly wonderful and THE ENDING which I did not see coming at all, has me grateful that this series is now completed because I honestly don't know what I would do if I had to wait a year.